Vienna is one of the three so called “sister cities of Europe” – Prague, Vienna and Budapest and so no wonder our guests would like to visit it while they are in Prague. It was during the Hapsburg reign, from the 16th to the 20th century that these cities were closely connected by culture as well as almost always ruled by the same monarch. This gives the cities a strong bond which is apparent still today. Vienna goes back to the Roman times however and became the capitol of the Austro-Hungarian Empire during the last 3 hundred years of it’s existence. After your leisurely breakfast, your driver will take you to your direct train to Vienna leaving midmorning and arriving in Vienna in early afternoon. Your reserved first class tickets will be delivered to your hotel in Prague. The train ride takes about 4 hours after which your driver will take you to your hotel in Vienna. Evening at leisure. You may want to take a tour to Grinzing, the wine district of Vienna, for an evening of wine and entertainment. After your included breakfast, please join us on a Grand City Tour of Vienna. 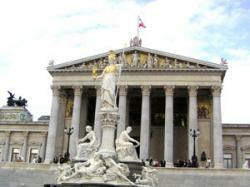 This tour will give you an overall impression of the most significant sights of Vienna. Along the Ringstrasse we show you numerous magnificent buildings, such as the State Opera House, the Museum of Fine Arts and the Natural History Museum, the cultural district, the Museums Quarter, the former Habsburg winter residence - the Hofburg, Parliament, City Hall and the Burgtheater. The highlight of this tour will be a visit of the showrooms of Schönbrunn Palace. In this former summer residence of the Habsburg family lived, for example, Maria Theresia. On the way back to the opera we pass by the Belvedere Palace, the former summer residence of Prince Eugen. Here you can get off and walk for ten minutes to the city center. Or, free of charge, you can transfer with the Hop-On Hop-Off bus back to the Opera house. The afternoon is at your leisure to explore other parts of Vienna. Visit the St. Stephens Cathedral in the very center, the Art History Museum, the Treasury at the Hofburg or other sites. Your morning is at your leisure to explore on your own. Your driver will take you back to the train station for your first class train back to Prague. Your Prague driver will then take you back to your Prague hotel. Please inquire regarding exact dates. Prices will vary accordingly. Please let us know which class hotel you would like. 3, 4 or 5*.